Memorabilia requires a passionate approach to framing as the labour involved is often not reflected within the overall client cost. 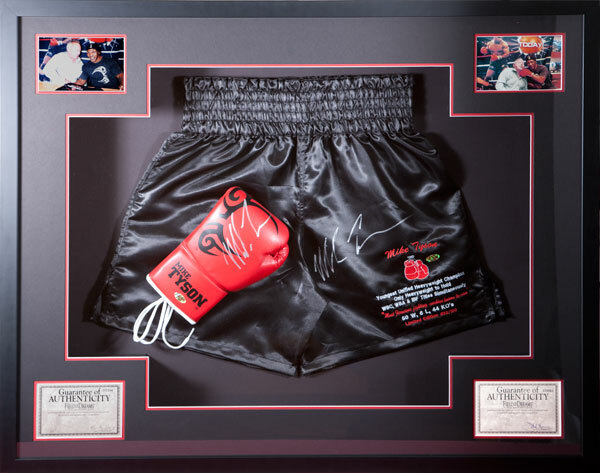 The framing of the Tyson glove and shorts combination was a demanding but extremely satisfying framing exercise. The shorts have been worked around archival foam secured by invisible thread. Due to frame depth constraints the glove has been worked around a custom made perspex mount allowing the 'clenched fist' presentation. Inner frames had been constructed supporting forward presentation of the certificates and photography. In addition to supporting the mat corners the inner frames have been covered in mounts allowing the main art opening to be reflected within the inner box.